The 153rd NEA-RA was held in Orlando, FL from July 3rd – 6th. 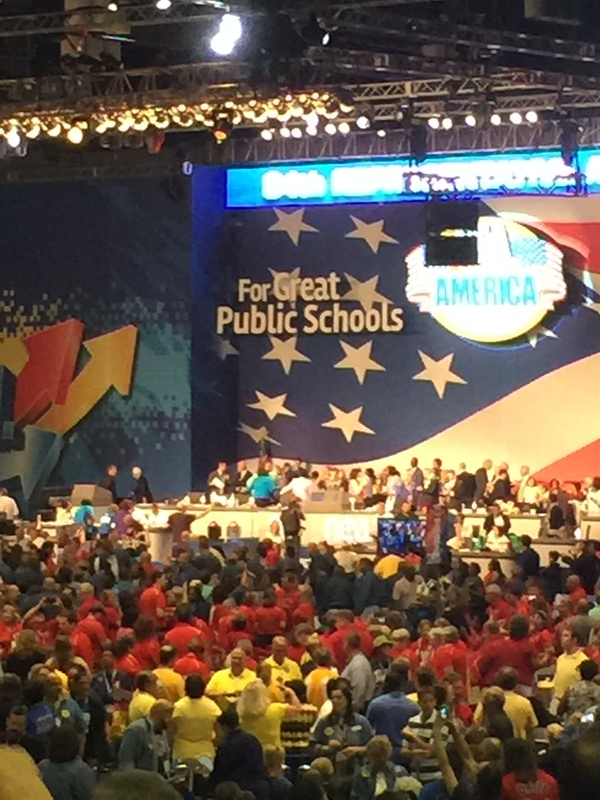 Described as, “the top decision-making body for the nearly 3 million-member NEA, and sets the Association policy for the coming year.” Attendees from SWEA included; President John Hackett, State Delegate Tim Zeuschner, Marissa Tassinari from TEMS and Joe Camire from SWHS. With the inspirational slogan of, “Unite, Inspire, Lead” SWEA delegates met with the Connecticut caucus to begin each morning led by CEA President Sheila Cohen and then joined 7,000 educators from around the country at the Representative Assembly. Hailed as one of the largest democratic bodies in all the world two items in particular were praised for their passage by the members. First, was a new business item addressing testing and its impact on students and learning, followed by a second NBI addressing issues of institutional racism. Formal Negotiations between SWEA and the Board of Education will begin this fall. Following two sets of surveys, and initial meetings in the spring of 2015, the Negotiations team met three times over the summer in preparation to bargain a new Contract for SWEA members beginning in 2016. Members of the team include: President John Hackett, joined by SWHS teachers’ Glenn Flanders, Tim Zeuschner and Joe Camire, Vice President Nancy Peck with Mark Laraia and Treasurer Bill Myers from Pleasant Valley. As well as Patti Stamper and Penny Hill from TEMS, John Smith-Horn from Orchard Hill and Julie Ratajczak from P.R. Smith. Substance of the surveys was a defining factor in creating proposals and preparing positions as meetings with the Board commence. John Smith-Horn, Negotiations Chair, has sent an email in regards to our meetings which can be read here. In early August, from the 3rd to the 5th, 5 members of SWEA attended the CEA Summer Leadership program at Mohegan Sun. Patti Stamper and Penny Hill from TEMS, along with Glenn Flanders and Joe Camire from SWHS spent three days with the Negotiations track. Each day brought new and exciting ways to look at Negotiations, ideas to present to locals about what trends are being seen around the state, and comparisons of contracts already negotiated. Tim Zeuschner attended as a member of the CEA Board who worked to outline goals, policy statements and professional activities for the coming year. Finally, President John Hackett was a presenter for the New Presidents track, working with local leaders from around the state.